Now over a decade into their career, Paris' Spektr rank among the more eclectic of French extreme metal acts, drawing upon an even wider palette of sounds than countrymen Blut Aus Nord, Reverence, and the like. 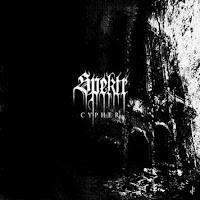 Cypher is their third-length, and perhaps their most varied, incorporating elements of down-tempo, industrial, ambient, black metal and even some jazzy percussive tempos into an admittedly unified whole that transcends the minimalistic black/white album artwork and outward appearance of the band, which for all appearances comes across as a purely cult metal aesthetic. That they manage all of this versatility without stepping on the toes of other, comparable acts like Thorns, CSSABA, Red Harvest, and Reverence is a testament to their creativity, but in listening through the album I felt like there was a dichotomy between the commonality of, say, their riffing compositions, and everything else happening. Spektr love samples, and put them to good use, threading them atmospherically through the tracks, and not just as intros, but saturated with effects to create a deeper, resonant effect. Granted, some are pretty obvious like the Rod Serling/Twilight Zone material ("The Singularity"), but they still fit into the band's oblique and ominous themes, and help provoke a sense of the unknown here. Cypher has a good deal of variety when it comes to its individual makeup of tracks. Some, like "Hermetism" or "Decorporation", are little more than vignettes and interludes of rumbling, dark ambient; whilst others, such as "Teratology" or "Cypher" itself are rather enormous, clocking in at 9-11 minutes. Lengthy bursts of solemn, spacious noise and feedback are balanced off against metallic surges of Scandinavian styled, dissonant/minor riffing, while the bass lines are configured into whooshing grooves that help transform Spektr's obfuscated landscape into something more distinctly interesting and progressive in nature than your garden variety industrial/black. The programming and drums are likewise curious, ranging from a live kit feel to more noise-integrated glitch mode, but often dropping out for long periods of time that the ambient elements cna take center stage. In terms of riffing style and substance, I did feel like there were a number scattered through the album which felt pretty typical or familiar of old Norse influences; but then, there were moments in tracks like "Antimatter" where they took on a more psychedelic impact not unlike Finland's great Oranssi Pazuzu. This is also more or less an instrumental outing: you might get a muffled growl or a scream, but the samples provide most of the 'narration' for the album. Thankfully there's so much going on elsewhere that it doesn't lose anything by way of this omission. Some leads and snarling, wretched vocals would have helped the album in the long run, but it's nonetheless an effective nightmarescape, frightful and perturbing if not utterly hostile and inaccessible. 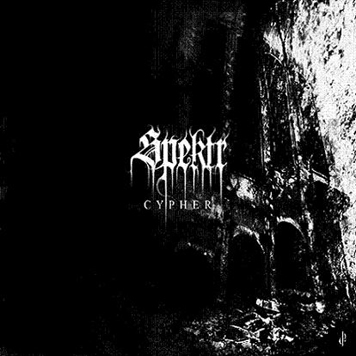 I'd cite "Teratology" as a particular favorite for that noisy, jungle/jazz intro, and "Antimatter" for how its roiling, textured noise erupts into the sharpness of the black metal guitars, but all around, Cypher is quite something to experience in the isolation of your own slipping sanity; and especially if you dig similar acts like Stagnant Waters or Reverence you'd do well to grate your teeth on this.